Welcome to a woodland paradise oasis. The Alaska Highway is an incredibly scenic way to explore the Yukon and parts of British Columbia. 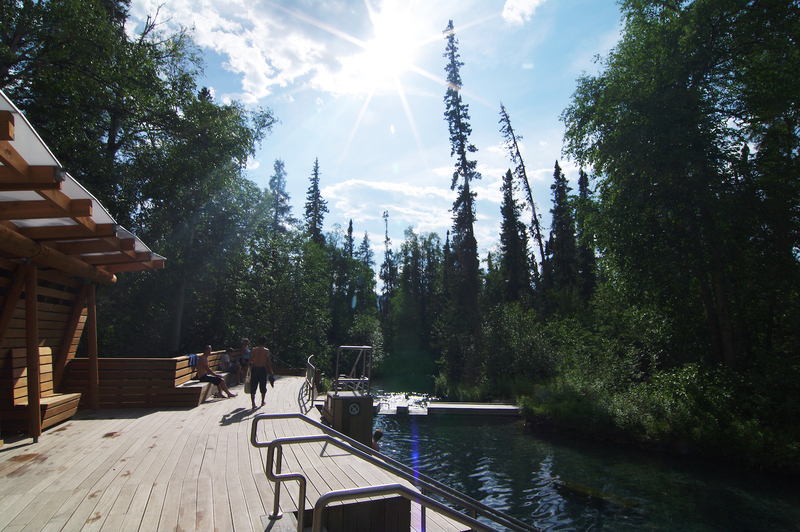 While you're roadtripping down this iconic route do yourself a favour and take a detour to Liard River Hot Springs Provincial Park. Here you can rest your weary bones while soaking in a year-round hot spring woodland oasis. "Liard River valley Alaska Highway British Columbia Canada sunset light on approaching summer thunderstorm clouds"
The scenery in the Liard River Hot Springs Provincial Park is absolutely stunning, but the main attraction of Liard River is, of course, the two hot springs: The Alpha Pool, which is more shallow and warm, and the cooler, deeper Beta Pool. The Beta Pool is permanently closed (for now, at least) due to bear traffic. There's an observation deck over the Alpha pool with a raised walkway leading around the park (so visitors don't disturb the muskeg in the swamp), plus a changing room, outhouse, and playground. If you decide to take a dip in the pool, be sure to swim by the little waterfall for a natural shoulder massage as you soak in all the mineral goodness. Ahh! If you do most of your park-visiting during the summer, think again! Liard River Hot Springs is a great destination year-round: during the warmer months you can spot moose and bears and 14 kinds of orchids (which are the reason the park was known as the "Tropical Valley") but the place is downright magical in winter. Everything is calm and peaceful and shrouded in steamy mist-- plus nothing beats jumping in a hot spring and relaxing on a crisp, cold day! The rest of the park is 1082 hectares (whatever that is) of lush boreal woodland beauty. They've also got camping, hiking, and biking, in case you want to work up a sweat before taking a dip in the spring. If you still want to take advantage of the benefits of chilling out in a hot spring but don't like roughing it, then you're in luck-- the lovely Liard Hotsprings Lodge is located right nearby! The gorgeous rustic hotel is a 10 minute walk away from the pools. Or spend the night at the Northern Rockies Lodge and Campground. Located directly on the Alaska Highway this is a great stop right near Muncho Lake, Liard Hot Springs, and Toad River. You can also enjoy some backcountry action if you head to the Muskwa Kechika region. Here you'll find a motel, lounge room, cabins, lake chalets, RV campground, restaurant, and even a gas station.